Wow, it’s already Wednesday again. Today in my art world, I’ve been working more on my visual journal. I completed a couple collages based on a trip to the New Vrindaban Temple yesterday and I inked a pencil drawing I did last week. 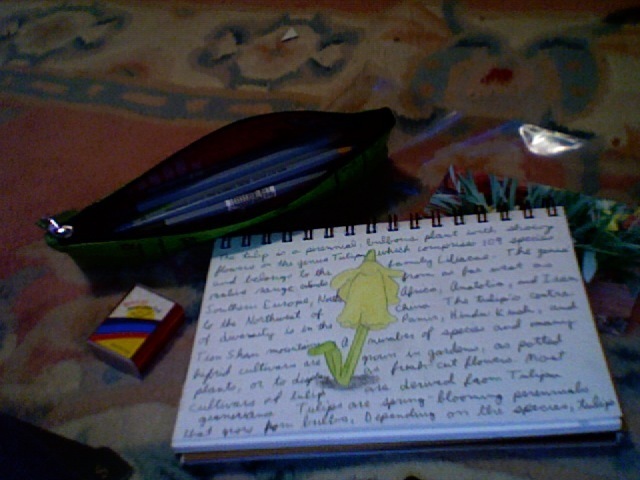 Right now, I just completed a drawing of a new tulip. The text around it is taken from the Wikipedia entry for tulip. I’m just drawing on the floor right now in my sitting room, so you can see the area rug there. Also in the picture, my pencil bag made from recycled rice bag from Cambodia, a picture I used as a reference, my pencil sharpener, and an ink pen. I love how that flower pops up between your writing. Sweet.